I called this small city home for three years before moving to the southern end of Italy. Returning now, it’s as if I never left. Giuliano remembers my morning ritual, the shoe vendor at the mercato greets me as though he saw me just last week, and I easily slide back into my comfortable routine. 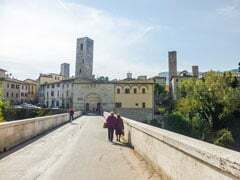 Ascoli is just one corner of Le Marche, a hidden region that offers the classic Italian lifestyle of good food, great wine, and cultural attractions for around $2,000 a month for a couple, and that’s including rent. Towns here are on a human scale, often small enough to get around on foot, by bike, or scooter. Most are large enough to have shops, restaurants, cultural attractions, and services, yet remain small enough to be personal and engaging. And despite the appeal and art it holds, it remains largely off the tourist track. And that’s just fine with the Marchigiani, who are practical, unpretentious kinds of folk. They like their slow-paced lifestyle, while welcoming visitors who take the time to come and experience it for themselves. Sometimes it’s faster to drive down to the coast and up the next valley, rather than taking the squiggly inland roads that scale and then descend the inland hills. Le Marche, Italy has good food, great wine, and is the perfect place to experience the classic Italian lifestyle. 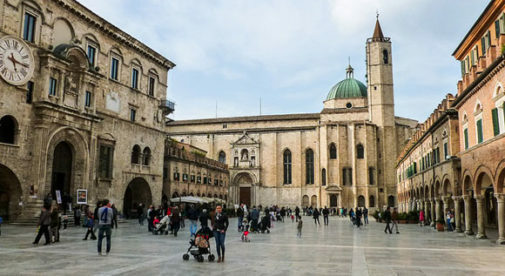 But Le Marche isn’t “backwoods.” It was the birthplace of the noted Renaissance figures Raphael and Bramante, the opera composer Gioachino Rossini, and Italy’s beloved poet, Giacomo Leopardi. There is a renowned opera festival in Macerata and glorious art galleries in all the larger towns. Cultural events, exhibitions, and grand historic festivals are part of the joy of living here. The Republic of San Marino, the world’s oldest sovereign city-state, sits partially within the confines of Le Marche. Dramatic scenery and natural wonders also abound. From the limestone cliffs on the Conero peninsula to the canyons, gorges, and waterfalls of the mountains, there is much to enjoy in the great outdoors. You’ll find underground thrills, too—the Frasassi caves are an exceptionally well-maintained cavern system, with otherworldly looking formations in its depths.